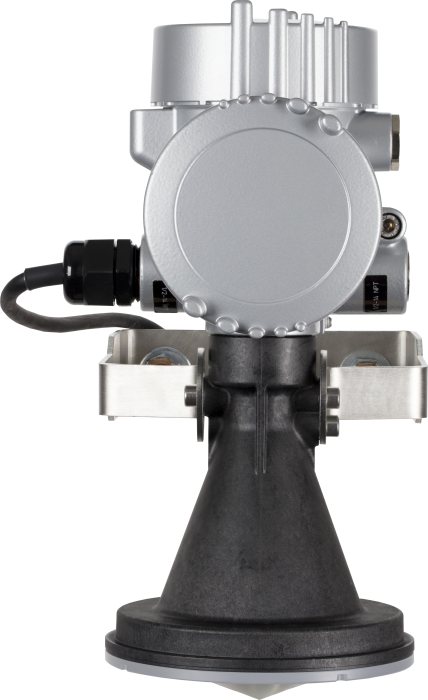 The CS475A radar sensor monitors the water level of rivers, lakes, tidal seas, and reservoirs. The sensor is ideal for areas where submersed sensors can be damaged due to corrosion, contamination, flood-related debris, lightning, or vandalism. It emits short microwave pulses and then measures the elapsed time between the emission and return of the pulses. The elapsed time measurement is used to calculate the distance between the sensor and the target (for example, water, grain, slurry). The distance value can then be used to determine depth of the medium. The CS475A outputs a digital SDI-12 signal to indicate distance and stage. This output is acceptable for recording devices with SDI-12 capability, including Campbell Scientific data loggers.